Louisville businessman Matt Bevin announced Wednesday he'll take on McConnell in a Republican primary, saying the five-term incumbent has been in office long enough. "The people of Kentucky deserve better. The people of Kentucky are demanding better. And I'm in this race to give them an alternative," Bevin told CNN. Bevin made a formal announcement Wednesday morning at an event at the state capital in Frankfort, Kentucky, the first of eight scheduled campaign stops across the state in the next three days. 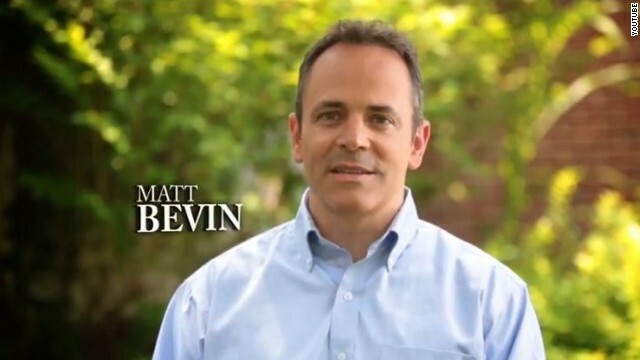 Along with introducing himself to Bluegrass State voters, Bevin's also out with a new ad. "Mitch McConnell has had a long career in politics, but after thirty years in Washington, is his leadership really the best we can do?" Bevin asks in the spot. In the commercial, Bevin's also criticizes McConnell's record, putting his campaign in attack mode right off the bat. The spot hits McConnell's vote for the fiscal cliff deal at the beginning of the year when the Senate approved a measure raising the federal income tax rate for individuals making $400,000 and households making $450,000. It also blasts the incumbent senator for his confirmation vote of two "liberal judges," referring to Supreme Court Justices Ruth Bader Ginsburg and Stephen Breyer. McConnell's campaign welcomed Bevin with an ad of their own. The TV commercial, which the campaign says they're spending six-figures to run statewide, slams Bevin for receiving $200,000 in state grants after his Connecticut-based bell manufacturing company and a specialty gas cylinder manufacturer, in which he had minority stake, were destroyed in a 2012 fire. According to a local newspaper article at the time, Bevin's insurance barely helped out. The ad hits Bevin for taking "taxpayer bailouts" despite saying he's a "conservative businessman." The spot also blasts Bevin for failing to pay $116,000 in taxes in recent years. "Bailout Bevin: Not a Kentucky conservative," the 30-second ad concludes. In the run-up to his campaign launch, Bevin met with Kentucky based grassroots conservative and tea party groups, as well as national outfits, including the Senate Conservatives Fund, a super PAC once associated with former Sen. Jim DeMint that's known for supporting successful challenges in GOP primaries. Matt Hoskins, the group's executive director, said Wednesday morning they were "open" to supporting Bevin's campaign and they're "waiting to see if the grassroots in Kentucky unite behind him." "The only way to defeat Mitch McConnell is to inspire the grassroots to rise up and fight for their freedoms," he continued. "We will also be watching to see if Mitch McConnell debates the issues or if he conducts a dirty smear campaign. If McConnell doesn't respect the voters enough to defend his own record, he doesn't deserve to be in the Senate." McConnell, who's up for a sixth term in the Senate next year, already has a hefty war chest with close to $10 million cash on hand. Asked how Bevin will compete against McConnell's haul, a source close to Bevin said the businessman would be able to self-finance to some extent. But Bevin tells CNN money's not the issue. This is not a race that's gonna be won on money. It is a race that is going to be run on the grass roots. All that money, it buys air time. But all that money does not make people turn out to the ballot box," added Bevin. McConnell has an opponent on the Democratic side. Kentucky secretary of state Alison Lundergan Grimes announced her Senate bid earlier this month. If Mr. McConnell loses to a challenger from the ever more insane Right, that will be a real measure of how damaged the GOP is. The further right they go, the less popular they become, and the more elections they will lose. Hey, anything's possible. Go ahead, put Bevin up, Kentucky "tea partiers". You'll get a Democrat for governor. Hey Matt, take this from someone who knows . . . You're not gonna make it . . . It's difficult to beat the system, Matt. 'ol Mitch has got connections. Probably waaaay more than you will ever dream to have. Don't get me wrong, It would be nice to get somebody who can run against a "Lifer" and actually Win. All you have to do is take a look around at the other "Lifers" Grassley / Hatch / Cantor / Baynor / corker / "corny" cornyn / – – Shall I go on ?? GREAT, that's all we need is another tea / nut job in congress. I can be a bigger nut job then any of them if the tax payers paid me $200,000 a year. Mitch, your toast. Vote the GOP out in 2014! I agree.........McConnell has been in office long enough, and we need a new conservative to fight for the people of Kentucky, and we need a fresh leader in the Senate to support restoring America. not a kentucky resident, wish i were nothing would make me happier that for the "almighty pure" mitch mcconnel to get beat in the forthcoming election. WE NEED NEW IDEAS, and new leadership, anyone but mitch or the teapods. As long as McConnell is voted out, I don't care who takes his place. Let him go home and take care of his wife, since he is whinning about everyone attacking her because of her ethnicity, but it was okay for him to attack Mrs. Obama. Wonder why? Was it because Mrs. Obama is too black for his taste and blacks don't have rights or deserve respect because of their skin color? Just vote the grand dragon of the KKK out please Kentucky. He thinks that Americans will forget all of the BS he spewed and re-elect him to office. The only ones who will vote him in are the ones that think the same way McConnell does and we know that there are a lot of them in Kentucky, but hopefully good will conquer the evil McConnell spews. "We will also be watching to see if Mitch McConnell debates the issues or if he conducts a dirty smear campaign. If McConnell doesn't respect the voters enough to defend his own record, he doesn't deserve to be in the Senate." That first line is a serious punch to the gut. It makes smear ads by McConnell look like he's running from his record and hiding something. The last line, Republicans have always been the masters of name calling. "Mitch McConnell has had a long career in politics, but after thirty years in Washington, is his leadership really the best we can do?" Bevin asks in his first ad." McConnell couldn't even get his number one goal of 4 years standing accomplished. That alone ought to be the major clause in his marching orders .. for GOPerville, anyway. Come on Kentucky, get the McConnell political book closed and send him on his way to the private sector. mitch is destined to become the new majority leader in the senate. don't waste your time and other peoples money mr. bevin. Democrats country wide are LOVING this in-fighting!!! Save your money. You have no prayer. He will beat you... and become the new Senate Majority Leader in the process. Just what KY needs a younger "moderate" which is what the old guy was until the tea trolls took over his party. Let's face it. Rethugs bad for the country at any political level.